An aerial shot of Hamilton’s harbourfront. 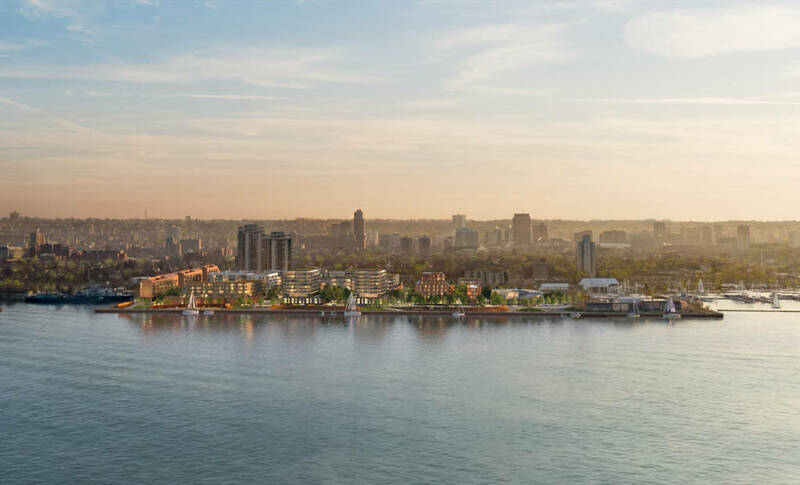 The City of Hamilton Council has selected Waterfront Shores Corporation as the preferred proponent for the Pier 8 waterfront development. The Waterfront Shores Corporation is a consortium comprising Cityzen Development Corporation, along with Fernbrook Homes Group, GFL Environmental, and Greybrook Realty Partners. Directing the design of the development is Hamilton-born architect Bruce Kuwabara of KPMB Architects who will work with gh3 Inc., Omar Gandhi Architect, and superkül. The 5.24-ha (13-acre) development site will support new residential, commercial, and institutional space on nine development blocks. More than 1000 condominium units will be spread across 20 separate buildings, with at-grade townhouses located on all eight residential blocks. Sixty-five of these units will be administered as affordable housing by Habitat for Humanity Hamilton. 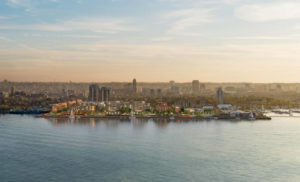 Waterfront Shores will be targeting Leadership in Energy and Environmental Design (LEED) Gold and WELL certifications. The consortium also seeks to incorporate the latest technologies to increase building performance, while limiting the development’s ecological footprint. For more information on the Pier 8 waterfront development, click here.